"I am so happy with my results and seeing my friends so happy has been an experience I won’t forget. Everyone says that Year 11 summer holidays are the best in your life but most people I know have spent it worrying about results day. Over these 5 years at Whitmore I have come to know the value of a good teacher and my teachers have inspired me to be a teacher in the future." "At last the long awaited results day has finally appeared – full of both impatience and joy. I’d like to thank all the teachers here who have helped me. However, it is also very important that each and every one of us realises we have overcome one hurdle in life – but many more await us as we move into the Sixth Form!" "I had unconditional support from my parents and teachers and without them I doubt I would have had enough motivation. In the future I want to pursue a career in finance and economics, becoming a banker or entrepreneur." 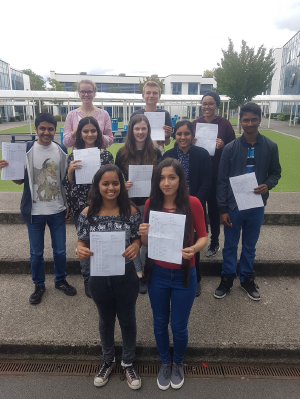 "I am EXTREMELY relieved and happy after opening my GCSE results. I worked very hard to achieve these grades. After A Levels at Whitmore’s 6th Form, I am aiming for medicine at university." "The school has helped us grow into confident young adults with skills that will stay with us for life. Whitmore teachers genuinely care about us as individuals." "I am very happy with my results. I could not be happier unless I had got 11A* grades! Any praise or words of congratulations should be given first and foremost to my loving and supportive parents and my wonderful friends." "I’m just really happy … I really don’t know what I want to do in later life but I’m glad GCSEs are over!"